The day we've been waiting for has happened! 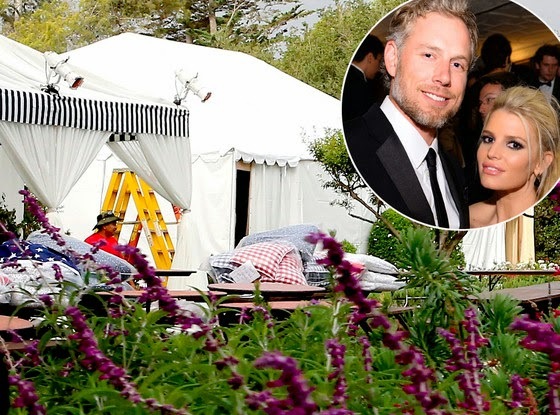 Jessica Simpson and Eric Johnson are married! The love birds have been together for four years and have two sweet babies together and they have tied the knot yesterday in Montecito, California, at the San Ysidro Ranch. The details of the wedding and ceremony are just so full of love that you may get a sugar rush just from hearing about all the sweetness that happened. Jessica's sister Ashlee Simpson and her best friend CaCee Cobb were bridesmaids. Eric and Jessica's kids Maxwell and Ace also walked down the aisle for the big event. I don't know about you, but that would have been the moment I would have started crying. Seeing their adorable kids would have started it for me. And then of course seeing Jessica, and then seeing how Eric looked at Jessica. Other guests at the wedding included Ashlee's fiance Evan Ross, CaCee's husband Donald Faison, and Jessica Alba and Cash Warren were there, too. Total guest count was 250. Wow! Jessica wore a custom Carolina Herrera gown and I cannot wait to see it. This wedding had to be postponed twice. The first time because Jessica was pregnant with Maxwell; the second time because of the couple expecting Ace. Maxwell is 2 now; Ace, 13 months -- what a great time to get married. So much love! The night before the couple hosted a BBQ with dancing, karaoke, and they played horseshoes and croquet. This couple seems to have such a genuine love and I wish them all the happiness.